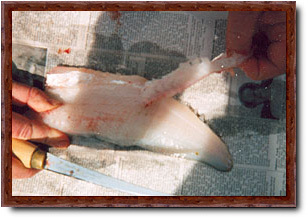 1) Put your knife behind the fin with the blade pointing down. 2) Cut straight down to the backbone without cutting through the backbone, and then turn your knife sideways to point the blade towards the tail. 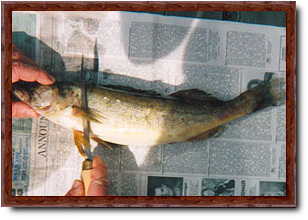 3) Now cut straight down the backbone to the tail. 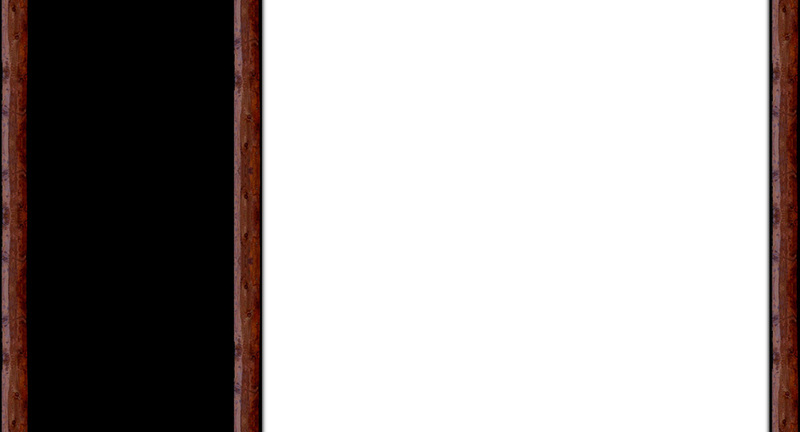 You will be cutting through thin bones, which we take out later. 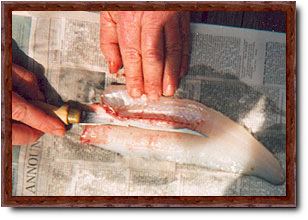 4) Now you have the fillet sliced off the fish. The next step is to take out the rib cage. 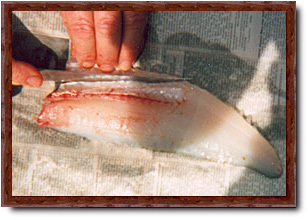 5) Put your blade at the edge of the rib cage and slice along the rib cage about 1 inch in. Keep the edge of the knife close to the rib cage so you don't cut into the meat. 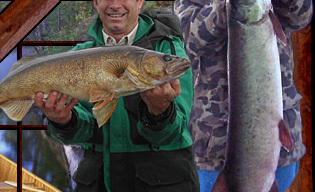 6) On a 2-pound Walleye, the rib cage is about an inch wide and 5 inches long. Point the blade down on the other side of the rib cage and slice down about 1/8th of an inch the whole length of the rib cage. 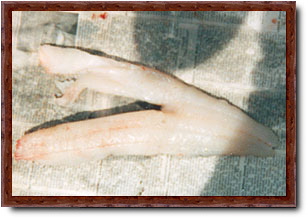 7) Now grab the rib cage and rip it out. 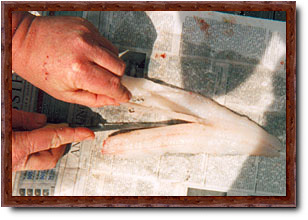 8) Hold the thin end of the fillet (the tail) with your fingernail and cut down to the skin and then cut straight along the skin while keeping the knife close to the skin so it's basically scrapping it. Go all the way down to the end and remove the skin. 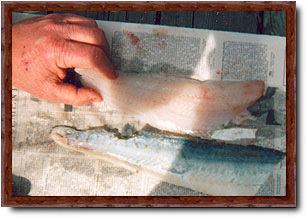 If you are taking the fillet back over the US/Canada border, you need to leave an inch of skin on for species identification. 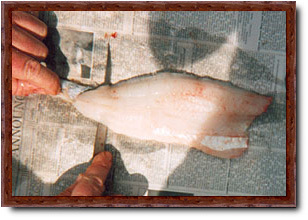 9) Now you have a fillet but there is still a tiny row of bones to cut out. 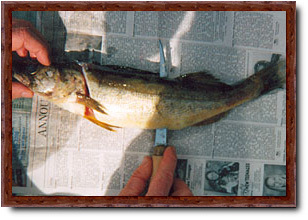 10) If you catch a 2-pound Walleye in the south, this row of bones will be so thin that they dissolve when you cook the fish. 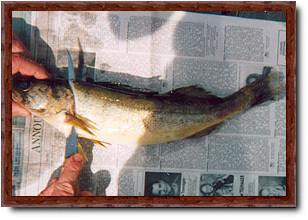 In the north, a 2-pound Walleye could be three times as old as a fish in the south thus their bone structure is more developed. In the north, you have to cut this extra line of bones out. You can feel the bones with your fingers. They go about half way down the fillet. Cut through the fillet on either site of the ridge of bones and take them out. 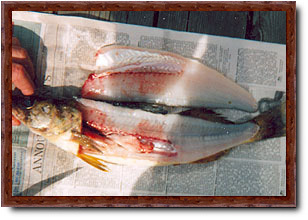 11) Now wash the fillets in clean water and they are ready to cook. 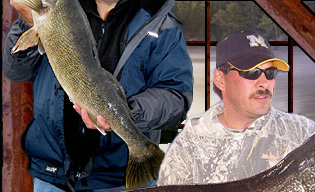 There is another way to clean a Walleye but this is the easiest.